Extension ladders have single rows of steps that slide together in sections to make for easy storage and portability. Extension ladders can be very awkward and heavy. Ladders come in various sizes and extend as high as 40 feet. The most common ladders for home use are 16- and 24-foot extensions, which will work for most household jobs. The most popular extension ladders are made of aluminum or fiberglass. Homeowners typically prefer the aluminum ladders because they are lighter to maneuver and less expensive. 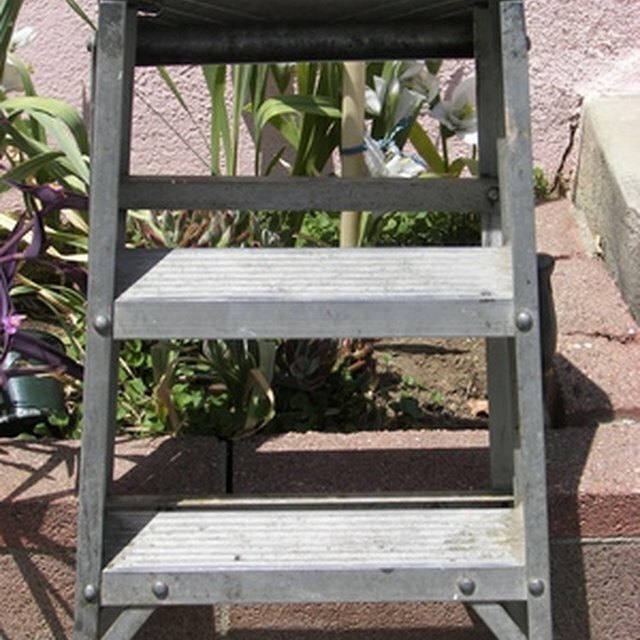 Pads can be added to the top of the ladder to avoid scratching the surface on which it rests, and foot extensions are available for the occasional job that requires more height. Most extension ladders are safe to hold weights up to about 250 pounds. Extension ladders have single rows of steps that slide together in sections to make for easy storage and portability. Extension ladders can be very awkward and heavy. Ladders come in various sizes and extend as high as 40 feet. The most common ladders for home use are 16- and 24-foot extensions, which will work for most household jobs. The most popular extension ladders are made of aluminum or fiberglass. Homeowners typically prefer the aluminum ladders because they are lighter to maneuver and less expensive. Pads can be added to the top of the ladder to avoid scratching the surface on which it rests, and foot extensions are available for the occasional job that requires more height. Most extension ladders are safe to hold weights up to about 250 pounds. The user must make sure the surface is strong enough to hold the ladder and his weight before climbing. The gutter, roof or building edge should be secure and free of clutter before laying a ladder against it. The ladder should first be laid on the ground with the feet butted up against the edge of the building. After raising the ladder, the user should pull the feet away from the building, typically about 3 to 4 feet. The climber then pulls the top away from the building to use the pulley and rope system to raise the ladder to the desired height. Large metal clips will stop at any step. Before resting the top of the ladder back on to the building, the climber should make sure the top of the ladder doesn't hit any windows or other delicate spots. The feet of the ladder must be level to insure safe climbing. The user can either adjust the ladder until the feet are on solid ground or insert blocks to support the uneven footing. Extension ladders should always be climbed facing the building. Tools should be carried on a pulley attached through one of the top rungs or worn on a belt to free up both hands for climbing. Climbers should wear rubber soled shoes or boots to avoid slipping. To secure the area, there should be a watch person standing by or the climber can rope off an area with yellow caution tape or something that warns passerby that the ladder is in use. Wind and overhead power lines often can interfere with safe extension ladder use and should be avoided.